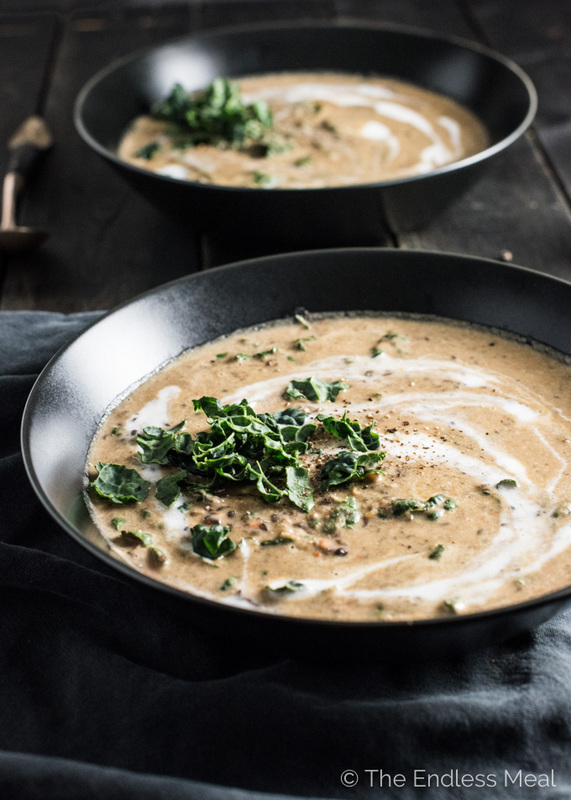 This gingery Coconut Lentil Soup is a warm, feel-good winter soup that is as healthy as it is delicious. It's a naturally gluten-free and vegan dinner recipe that will make keeping your resolutions easy. Truth: I've made this coconut lentil soup deliciousness twice in the past four days and eaten it for lunch on the days after I made it. That's four days in a row of eating the same thing, and I can't get it out of my head that I need to make it again. Tonight. How am I even a food blogger? On days when I'm not blogging, I'm 180 degrees opposite of that. When I set out to make this I had no intention of sharing it with you. I also had no clue what I was going to make. I thought soup, but that wasn't written in stone. I thought coconut, but at one point it almost went tomato. Even the black lentils I found at the back of the pantry (which I bought in October for a Halloween recipe that never came to be) weren't really speaking to me. Please tell me your dinner planning sometimes looks like this, too? I'm blaming (thanking?) 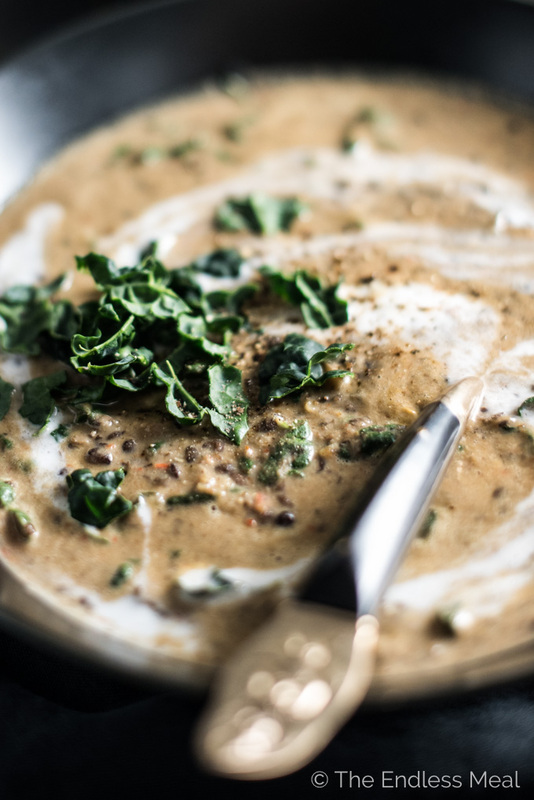 luck for turning this coconut lentil soup into a share it on the blog recipe. The first time I made it, my little girl devoured two kid-sized bowls and my handsome man couldn't stop raving. I even got a text the next day saying how good it was for lunch. The second time, when I measured ingredients and took photos, I made it for my handsome man's mom and sister. Hi, guys! Sidebar → Josh's sister Mudra is about to launch her ShopFryday online store where she'll be selling super fun shirts, socks, pins and other awesome things she's designed herself. LOVE badass chicks running their own businesses! I've already covered that it is AMAZING so I'll try not to go anymore used car saleswoman on you. 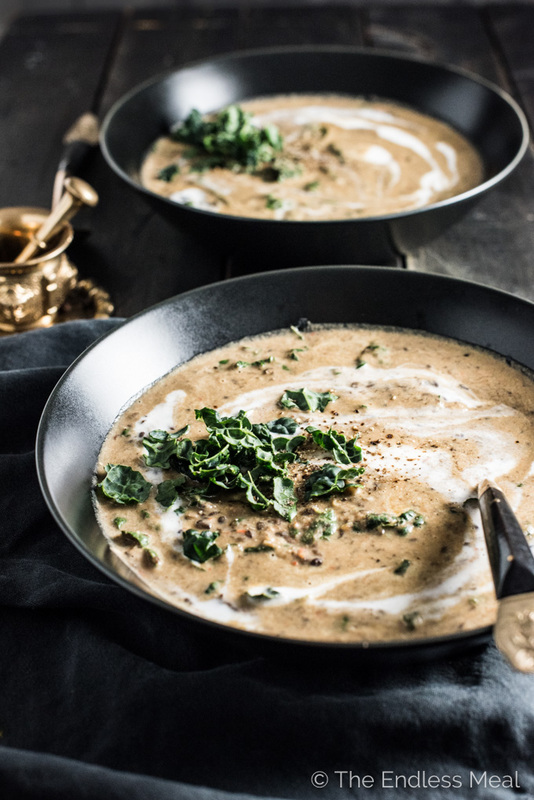 It has Thai-style flavors with the coconut milk, ginger, and garlic and you might be tricked into thinking that there is curry paste in here, but there's not. It's also incredibly easy to make. 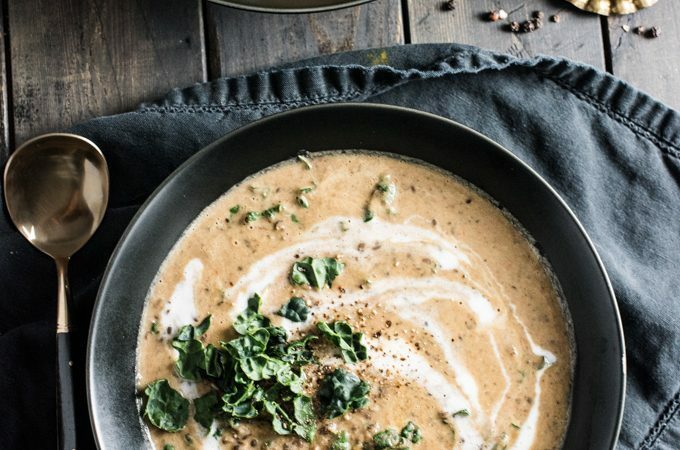 If you can saute onions and garlic, you can make this soup. That's not much of an exaggeration about how simple it is to make this soup. 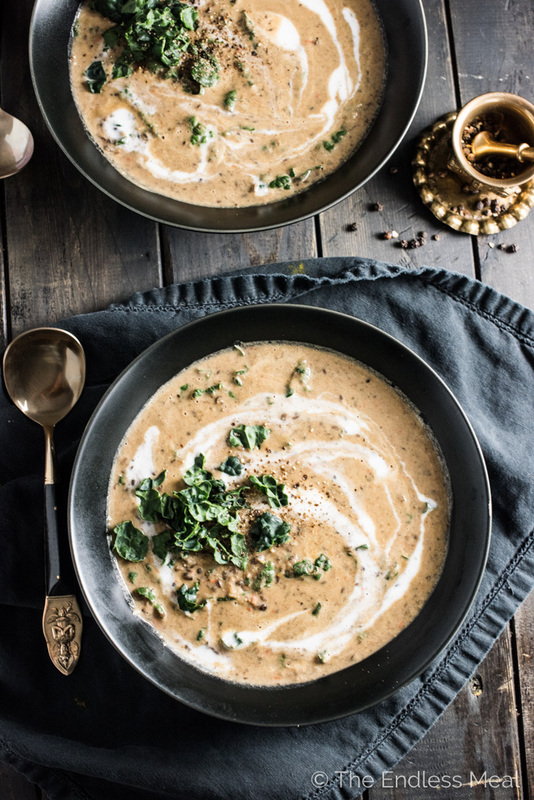 If you make this Ginger Coconut Lentil Soup make sure you snap a pic and tag #theendlessmeal on Instagram so I can like and comment on your photos. I love seeing TEM recipes you create! Heat the coconut oil in a large pot over medium-high heat. Add the onion and cook until transparent, about 3-4 minutes. Add the ginger, bell peppers, and garlic and cook until the peppers are soft, about 5 minutes. Add the stock or water and season with sea salt until it tastes a little too salty. (Once you add the coconut milk it will be seasoned perfectly.) Add the beluga lentils to the pot and bring to a boil. Reduce the heat, cover the pot, and let it simmer gently until the lentils are soft, about 25 minutes. Add the coconut milk and almond butter the pot and heat through. Use your blender or immersion blender to puree half of the soup. Add the kale and stir through. Serve with a swirl of coconut milk on top, if you'd like. Delicious! Perfect for dinner–easy to make and filling. Thank you! I’m so happy to hear you like it! You are so welcome! Great call on the jalapeno!! This is great! I just started chemo and this is one of the few things that still tastes good to me! Can it be frozen and reheated? Are the lentils dry or pre-cooked? I couldn’t find beluga lentils anywhere so I bought french green instead. They look similar and take the same amount of time to cook in the same amount of liquid. I am assuming the taste would be similar? Any comments? I might try to make this in the crock pot. Any suggestions? I’m thinking keep step one, then step two add the onion mixture, water and lentils to the crock pot. Cook high 4 hours. Then add the coconut milk and almond butter and cook another 20. Blend to desired consistency and serve. That’s exactly what I would do, too! I loved the soup with the peanut butter sub.. I only used a tablespoon. this looks delicious and the photos are awesome! I made this for dinner tonight. It is delicious! Hooray … so happy to hear you like it!! I don’t eat peppers- any suggestions on an alternate ingredient? Thanks! I do like lentils, and the combination of lentils, coconut milk, and ginger sounds fantastic. Also, love the addition of almond butter which might have introduced a smooth and rich consistency. And look at this velvety texture! I mean, there’s no any reason not to like this soup. Count me on:) Really well done, Kristen! I am curious. Did you try the peanut butter? How was it? The recipe calls for almond milk and the instructions call for almond butter. The ingredient list calls for almond milk but directions call for almond butter. I’m guessing you meant almond butter is hat you meant. Is it Almond Milk (like in the Ingredients) of Almond Butter like in the instructions?